Russian prosecutors have reason to believe that notorious Chechen terrorist Doku Umarov was linked to blowing up the Moscow to St Petersburg Nevsky Express train. 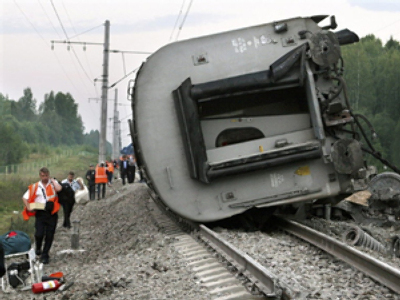 The express train was derailed in the Novgorod region on August 13, 2007, following a bomb explosion on the railway line. Sixty passengers sustained injuries, thirty of whom required hospitalization. The heinous crime was met with public outrage throughout Russia. Authorities suspected the attack was carried out by Chechen militants, nationalists, or may even have been part of a criminal dispute. Initially a 25-year-old ethnic Chechen member of an anarchist group in St Petersburg was arrested, but charges against him were eventually dropped. In October, 2007, two men were detained in the Russian Republic of Ingushetia on suspicion of taking part in the bombing. The investigators believed that Salanbek Dzakhkiev and Maksharip Khidriev bought the explosive devise and delivered it to the explosion site. The hearing on the bombing started this Tuesday. During the prosecution’s opening argument, the prosecutor stated the alleged connection between the crime and top terrorist Doku Umarov, who is being hunted in Southern Russia. “The terrorist act was conducted by a terrorist group under the supervision of Doku Umarov,” said the prosecution’s statement, which also refuted claims of pressurizing the defendants. Dzakhkiev and Khidriev face numerous charges, the most serious of which is punishable by a 20 year sentence. Their third alleged associate – Pavel Kosolapov – is still at large. Earlier Dzakhkiev and Khidriev, who have pleaded not guilty, were refused bail and denied a motion to be tried by a jury. However, they were granted a motion to be tried with three judges.